With the new HTC One M9, HTC is hoping to get back on track and further re-establish itself as one of the "godfathers" of the industry. Tough times are ahead, though - Samsung and Apple, two of the larger rivals, already have prominent offerings on the shelves, and stealing market share from those will not be that easy. Apple, in particular, has been on the run in the past few months, with its iPhone 6 and 6 Plus breaking all records and establishing themselves as the best-selling smartphones in the past few months. Samsung, on the other hand, has just churned out the Galaxy S6, a smartphone powerhouse that aims to rekindle interest in Samsung's Galaxy line. S6 Specs are solid and leave iPhone 6 in the dust. This is just another market segment for Samsung. It will be interesting to see how the 5.0 - 5.4" handset segment does with: - no swappable battery - no SD card upgrade - no water resistance Maybe these features are trending for the 5.5" and larger phones. Only time will tell. Samsung is doing the right thing. That battery live on that HTC!! 2840 mAh on a 5" 1080p will be awesome. I Think Samsung got it wrong there, 2500 mAh on a 5.1" 1440p, I think it's going to be good but not great. dont know man. gear vr with 1080p? even reviewers said the note showed pixels how many pixels will the m9 show? The Galaxy S6 already blew everything else outta the water! HTC M9 Looks better. However I wish to have both phones released so that We/ PA/the general public can find how each phone handles. The iphone is undeniably lacking in... well, everything. Ummmm, it literally is a remote. There's an included IR baster to control your TV. 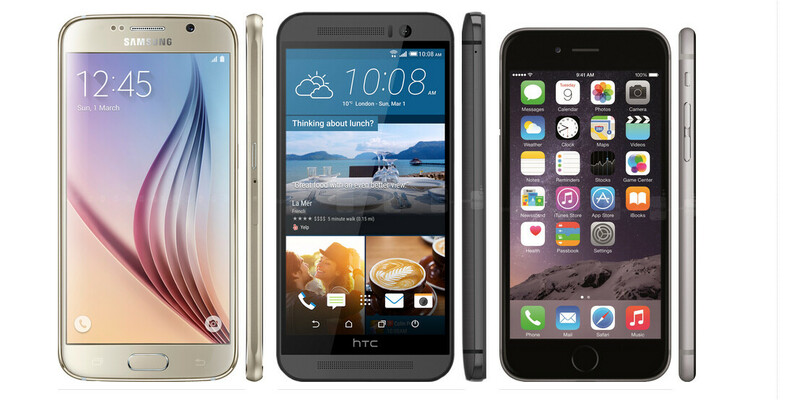 HTC wins with SD-slot, iPhone wins with Software-quality and Samsung wins because ... well, being the best copycat.